The weather has been great for the past week and many of us have had the opportunity to enjoy the great outdoors and clean crisp mornings producing quite hot days. 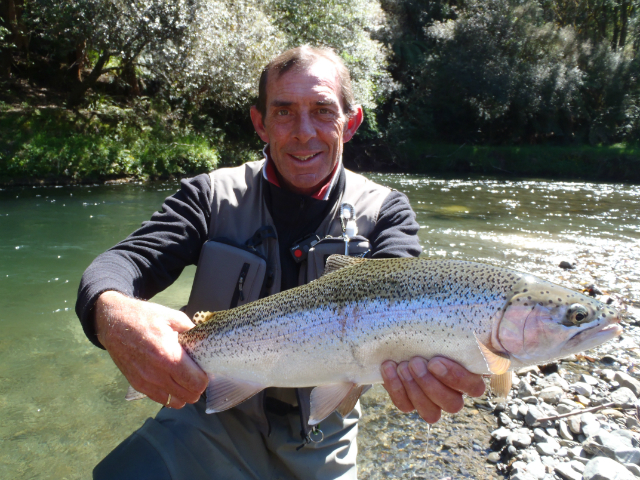 The local fishing in Taupo has been very unpredictable and many have found the angling challenging with very clear conditions and low rivers. 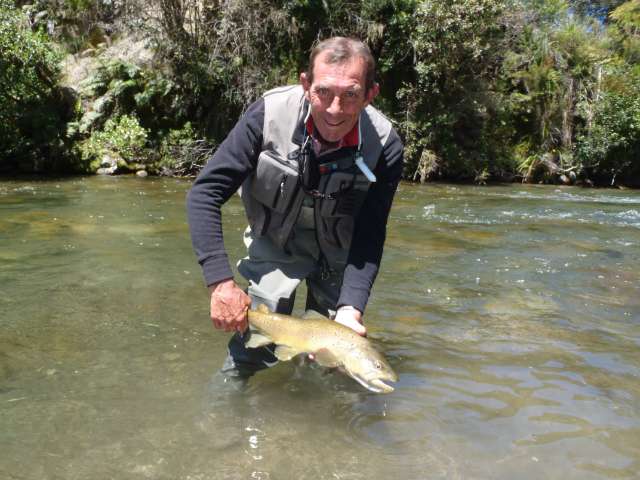 There are heaps of trout in the Tongariro but they seem to have developed lock jaw and I have only managed to rise a few fish from the faster broken water which offers extra oxygen and cover . 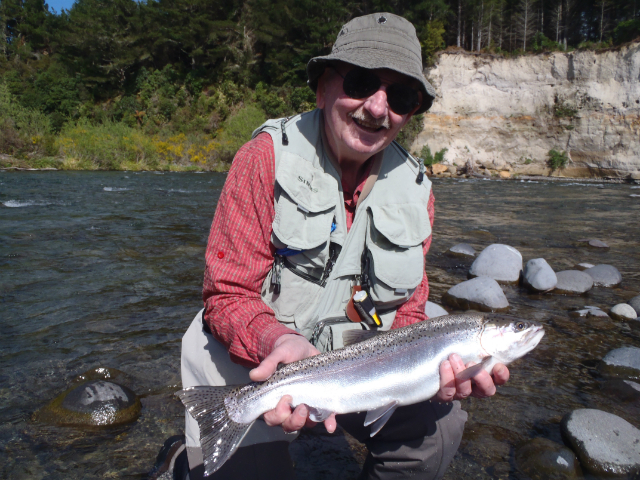 Many fish in the Tongariro are spawning fish or recovering fish but as we found out today there is the odd silver bullet mixed with them. I have been out twice this week with clients John and Allan from Sydney and literally been the only anglers everywhere we have been. Fishing has been hard for us but we managed enough trout to keep the enthusiasm high and with hard work eventually found a small patch of silver fish as far up as the Fan Pool. The majority of the fish we encountered were in the lower river but again they seemed to be very dark and on their way back to the lake for another season. Generally I have always thought that these fish were easy to catch but for some reason I have struggled with these stubborn buggers during the day. With the warmer evenings we have had some good evening rises happening on the Tongariro and I wonder if the trout have been filling up on these insects during the night and sitting full during the day? Lets not forget that the best runs are supposed to be right now or still to come according to DOCÂ but we will need a bit of rain to spark this I feel. As you can see from the photo’s I have been using all my spare time finding new water to guide on in the backcountry and my god we got some good stuff!! You could call this killing two birds with one stone as I can entertain Dad on some new water but also use him to test out these new areas and not feel too bad if we have a hard day.Â I thinkÂ my legs haveÂ travelled about 800km this week and the truck must have done more than that but thankfully we have had some great fishing and seen some beautiful spots thanks to near perfect days. The rivers backcountry are currently low and clear and that in my opinion is the perfect time to be getting into these places and make the most of early season fishing. Most fish have been very actively feeding during the day and there is no advantage on flogging the rivers at 6am unless you think it will be busy. 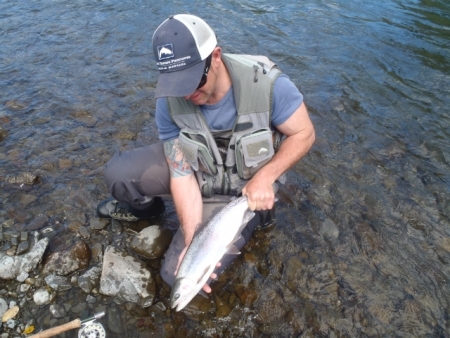 Backcountry fish seem to really come to life mid morning and will become more active as the day goes on and more food presents itself but if any anglers have been through before you will see your catch rate drop dramatically. Luckily for us this week we were able to catch fish in both the ranges we walked into and there seemed to be very little angler attention in these places which was surprising considering the weather we have been having. Yesterday was a dreamy day where we were able to use my little #4wt Sage and flick a dry and dropper about as the river was a bit like the Hine in the wide places. This river was clear and amazing and we could see nearly every fish we cast to which generally resulted in some positive attention from the trout depending on the species.Â I was expecting the fish to be about 1-2lb but as it happens we hardly saw a small fish and every trout must have been 3-5lb including two pretty browns which the old man caught . I have never found browns in this river and thought they were all Rainbows but I suppose at certain times of the year they are present in the upper reaches. Some trout I think may have been fished at already this season as they were just not having a piece of any of my nymphs and in fact at one stage they totally spooked on one particular fly so must get rid of that one. Generally they accepted the fly rather well and it was never too long before the next fish. I cracked the first fish this year on the dry which was extra exciting especially after seeing him finning in a slack piece of water at the side of the run, the fish grabbed a dry called a Split Flagged Adam’s. Backcountry fish fight really hard and dirty and I could not believe my eyes when a Rainbow of about 3lb leaped into the tree which was overhanging his pool and left me tangled and snagged, thats fishing eh! 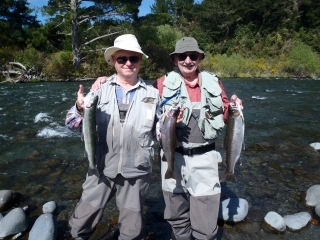 !Â In most cases we caught all our trout on the Quasimodo nymph or Green Caddis both which can be found home tied at Taupo Rod’n Tackle on Tongariro street. 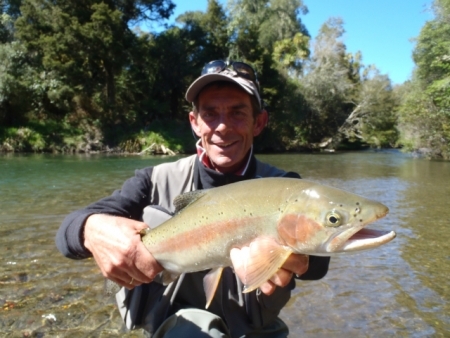 Summer bookings are coming in thick and fast at the moment and I have been lucky enough to get out and fish myself over the past few weeks to make sure days booked go to plan and we have some good water to use with back up plans attached but there are still some gaps and opportunities for rafting this season. If you are keen on getting on board and sharing a trip or booking one yourself please don’t hesitate to make contact.